Transport connections to Crete are excellent. Throughout the year, Crete is connected to Athens and therefore the rest of the world, by around fifteen flights a day to the two airports on the island at Chania and Heraklion. Between April and October, over a hundred charter flights each week connect the island directly with the whole of Europe including easyJet and Ryanair who fly directly to the island from twenty-six airports in nine countries. The nearest airport to our houses and villas is Chania, just half an hour drive away but Heraklion, (the capital of the island) whilst two and a half hours drive, provides even greater frequency of flights and often lower prices because there is more competition on the route. The daylight drive East to West is beautiful. The Greek national carriers are Aegean Airlines and Olympic Air who have flights from all major European cities � often several times a day on the most popular routes. Of course these connect with intercontinental airlines from all over the world. These flights allow you to maximise the time you spend in Greece, and can provide a stopover, or a longer visit, in Athens at no extra travel cost. If you'd like to include a short cruise in your plans you can fly to Athens first and spend a few days in the city before coming on to Crete on one of the luxury ferry-boats. We can assist you with your ferry-boat booking from Piraeus to Xania. Nowadays, an ever-growing number of people are driving to Crete direct. With the speed and sophistication of the long distance ferry boats from Trieste, Venice and Ancona it can make sense to drive down from northern Europe, particularly if you can carry several passengers for a longer stay. The routes are numerous but probably conclude as: Italy to Patras in Western Greece, a drive across Greece to Piraeus (only 3 hours) and then the overnight ferry to Crete. Of course you then save on car rental when you get here. We are experts on this method of travelling to Crete so please ask for more details. 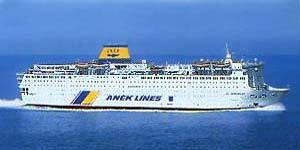 Click picture to visit ANEK Lines If you opt for conventional transport by plane or you catch the big ferry from Athens to Chania then once here, you can, of course, take a taxi from the airport or ferry port to your accommodation. However, the most practical transport option is to rent a car, secure in the knowledge that, regardless of delays or time of arrival, it will be waiting for you. We can expertly point you in the direction of a local car hire company - see below. to do more than just relax. There are many friendly and reliable Car Rental companies in Crete. We have found that one of the best is Auto-Kappa Cars, based in the beach resort of Platanias, between Chania and Tavronitis. The business partners Costas Katsafrakis and Nicos Binakis will deal with you personally and can arrange collection and delivery to either Chania or Heraklion airport free of charge. Prices for short stays are very competitive. There are discounts for longer periods. You could, for example, rent a car for your first week or two, return it for the main period of your stay, and then take it again for your last week or so.